The Transition Los Angeles city hub was initiated by a group called the Environmental Change-Makers. The Environmental Change-Makers had two founders: myself (the "secular environmentalist") and Peter Rood (an Episcopal priest). The Change-Makers paved the way for Transition in our metropolitan area with public meetings (i.e. awareness-raising and reskilling combined) on a variety of topics from bread baking to solar cooking to bike rides. Reverend Rood's church has offered free meeting space to the Change-Makers for 4 years, and now welcomes the Transition teams into its space. Over those 4 years, our outreach has brought power-down and Transition ideas to quite a number of different and diverse groups. In early 2008, the Change-Makers, Peter's church community, and a national nonprofit Urban Farming teamed up and tore out the side lawn of the church to create a community garden. 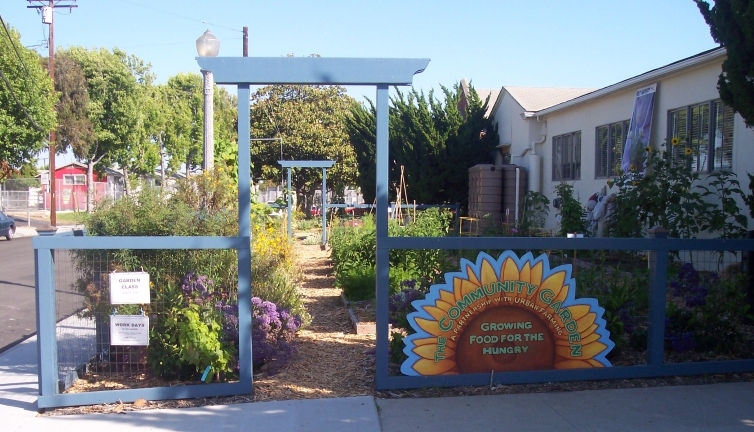 The garden is maintained communally as a teaching garden by Change-Maker members, and the food grown there is donated to the local food pantry. We're helping to fulfill one of the church's social justice goals to help feed the hungry. For two years, the Change-Makers have used the church's garden to teach an ongoing organic vegetable gardening class series to promote urban food production and peak oil preparedness. This class series provides not only reskilling -- it serves a significant outreach role in bringing new faces into the ideas of Transition. The garden has now been expanded to include a medicinal/culinary herb garden, three types of rainwater harvesting demonstrations, on-site biodynamic composting, and most recently a tiny orchard of fruit trees. And the garden effort has been expanded to include a local fruit harvest program, which sets in place the framework for a local food redistribution system. Peter Rood and I wrote a book about the Change-Makers, Environmental Change-Making, which was published at the same time as Rob Hopkins' Transition Handbook. The Episcopal Diocese of Los Angeles is the publisher of our book -- a book which is basically about how to build community and how (and why) to power-down. We view our book as "how to get a mainstream community ready for Transition ideas." Our book has been distributed to church communities and been posted in national church newsletters. Its maiden review was in L.A. Yoga Magazine. Christian Century magazine did a story on Peter Rood and included the garden and the Change-Makers' reskilling activities. At pretty much the same time, the secular Whole Life Times was interviewing Transition Los Angeles at the church site. Change-Makers and Transition Los Angeles speaking appearances have taken us into Catholic churches, Jewish temples, Yoga/Hindu centers, interfaith circles, Unitarian churches, Episcopal national conferences, and Wiccan conventions. Simultaneously, we've reached into corporate, governmental, environmental, and progressive circles -- the Sierra Club, the Rotary Club, green fairs, statewide homeshooling conferences, local city events, and more. The opening of the community garden was simultaneously blessed by a Jewish rabbi, a Catholic priest, and an Islamic imam, who later planted tangerine trees in a row side by side. A nearby Congregational church and a Methodist church are in the process of replicating the garden idea. When we hosted a site for the Step It Up campaign (predecessor to 350.org) and marched along a major street near LAX airport, participants included local religious leaders, local environmentalists, and the local Green Party (the minor political party). This past weekend, another Transition Los Angeles steering group member took Transition and post-petroleum ideas into a Catholic conference. And later next month, we will begin working with a Native American spirituality group which is curious about the Transition work we have been doing. Additionally, Peter and I have co-authored "white papers" to advise his bishop (bishop of the Episcopal diocese of Los Angeles) about Transition and post-petroleum preparedness within parishes, urging him to lead the way for other communities of faith. We have drafted "how to" documents to support the originator of the interfaith Genesis Covenant (50% CO2 reduction in 10years at religious facilities). I have given talks about how post-petroleum lifestyles further the keeping of the Yogic yamas and niyamas. Peter and I have developed a whole approach which teaches the principles of Transition as living social justice. We adapted them to local realization of the Millennium Development goals too. It's all in the presentation. Like Transition Heart and Soul groups, like the work of Joanna Macy and others, there are deep commonalities between all of these traditions. So often we focus on the differences: Jew, Christian or agnostic; temple or church versus grove-in-the-woods. But the healing work of Transition demands that we focus on the common points rather than the differences. Get creative as you look for those bridges. 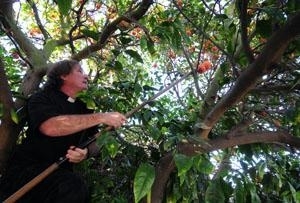 The site for Los Angeles' first Training for Transition was Peter's Episcopal church. 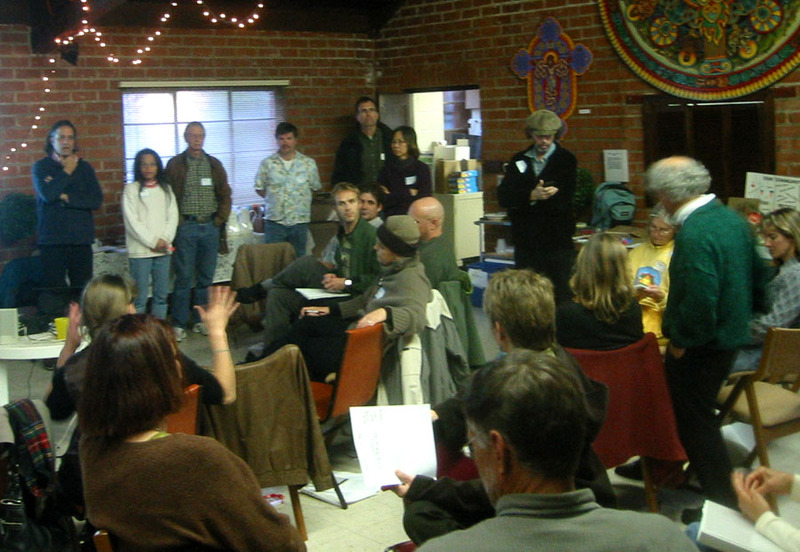 LA's second T4T took place in the United Methodist church of another steering group member, with the backup location being another steering group member's Jewish temple. Of our local pods, Transition Culver City meets in a United Methodist church, Transition Mar Vista meets in a Yoga studio, Transition San Fernando Valley uses a Unitarian church facility, Transition South Bay LA is holding some reskilling sessions in yet another Unitarian church, and the Environmental Change-Makers still meets in Peter's Episcopal church. These meetings aren't on a "rented premises" basis, but rather the result of building relationships within those communities, relationships which have blossomed and yielded multi-fold (free premises actually being the least of those benefits!). At a time when we need to get the Transition message out to vast numbers of people, as quickly as possible, to get many people on board the preparation and the planning, we don't have time to do it all from scratch. Forming Transition groups based upon one or two initiators and building up to critical mass within a community could take years. And we don't have years. We need to tap into existing pools of people whom we can inform of the Transition concept, existing pools of people who are already accustomed to working with each other -- which means we need to recognize and acknowledge them as existing pools of community. I guess the take-home message here is: when you consider diversity, don't overlook faith communities. When you do local awareness-raising and networking, don't be afraid of churches and religious centers. Just because they haven't been the traditional realm of environmentalists doesn't mean they have any less need for -- or eagerness for -- Transition ideas. As Peter Rood often points out, church is changing too. They just might surprise you. The Transition Los Angeles city hub is now 1 year old. While our first year was spent getting local pods going, we turn to 2010 with the recognition that we need to carry Transition ideas into ethnically, racially, and economically diverse neighborhoods of our vast city. We fully realize that we must overcome the crowd-of-white-faces problem within the Transition movement. But simultaneously we understand that the affluent "white faces" have perhaps the furthest distance to change in the Transition journey. We also realize that Los Angeles is the center of movies and media, and that if we can create consciousness change within the communities where the media-makers live, we stand a chance of altering what goes out through the media, i.e. changing the message that is heard round the world. an (admittedly older) list of faith-based environmentalism resources. When we go into a new community, we first try to determine what they already have in place within their faith tradition. Then we work with that framework to introduce Transition ideas. The Transition Network is currently reworking their forums. After the 1st of February, they will open a new format. At that point, Isabel Carlisle and the UK diversity project plan to open a topic to discuss diversity. Transition US is offering a conference call on "Diversity, Resilience, and Justice" on Feb 10. register here.